Boulevard 41, a new fast-casual pizzeria and taproom, will open at El Dorado Hills Town Center by the end of September. The eatery will feature hand-crafted Neapolitan-style pizzas using ingredients from mainly Northern California-based farms. The menu will consist of six 11-inch pizzas featuring the namesake pie that comes with mozzarella, prosciutto and goat cheese, as well as a Polynesian-style pie with house-made marinara sauce, a three-cheese blend, pineapple and thin slices of Canadian bacon. There will also be vegetarian options—like the Goddess pie with garlic cream, ricotta, mozzarella, roasted squash, garlic, arugula and drizzles of the special green goddess dressing—in addition to gluten-free versions. Patrons can also create their own pies, which will be flash-baked in under three minutes inside a 1.85-ton steel gas-fired oven from Healdsburg’s Mugnaini, or opt for an array of other dishes like the charcuterie-and-cheese appetizer platter or the candied pecan salad. Meanwhile, the taproom side will carry 41 self-pour tap handles, with a rotating lineup that includes pours from local breweries, cideries and wineries like Knee Deep, Track 7, Device and Two Rivers Cider, as well as out-of-towners like Sonoma’s Dry Creek Vineyard, San Jose’s J. Lohr Vineyards & Wine, San Diego’s Belching Beaver Brewery, Nevada’s Revision Brewing Company and Michigan’s Founders Brewing Co. The 2,300-square-foot restaurant, which will have a cool, earthy blue-gray color scheme and an outdoor waterfront patio, is aiming to please the under-21 crowd too. 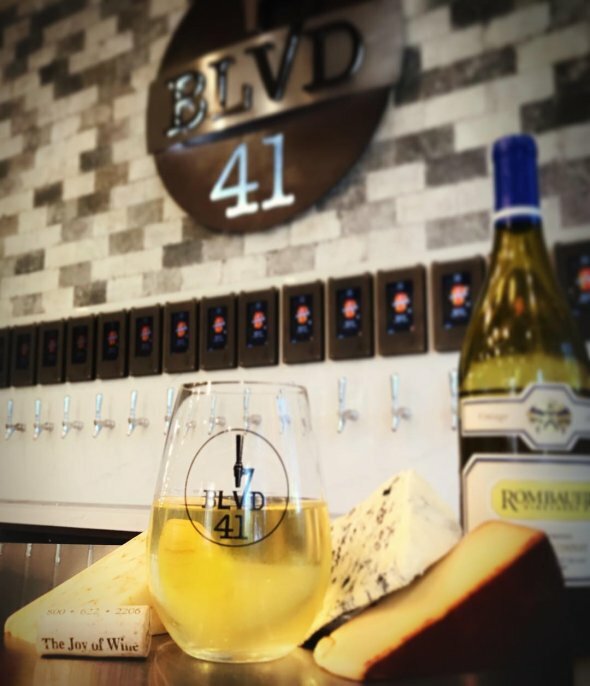 “While we do have 41 self-pour taps, we still want Boulevard 41 to be where soccer moms and their kids would feel comfortable having lunch together,” says general manager Shantel Koehler.